Last week, 87 states gathered in Geneva to discuss lethal autonomous weapons systems. This Informal Experts Meeting ran from May 13 to May 16 and was the first international discussion on autonomous weapons systems. The meeting was focused on information rather than decision making. The 87 states attended the meeting under the Convention on Conventional Weapons (CCW) along with representatives from UN agencies including UNIDIR, the International Committee of the Red Cross (ICRC), and registered non-governmental organizations including the delegation of the Campaign to Stop Killer Robots. The four day meeting included general debate and then substantive sessions with presentations from experts. The Chair’s summary showed that there is a willingness to pursue this topic and a possible issue for the next meetings would be the concept of meaningful human control. The options for going forward cited include exchange of information, development of best practices, moratorium on research, and a ban. 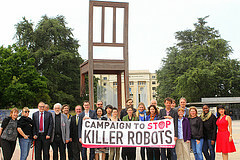 The Campaign to Stop Killer Robots has a great piece about the meeting on their website. Over the course of the week many states highlighted the importance of always maintaining meaningful human control over targeting and attack decisions. We are MAC were not only pleased that 5 countries have already called for a ban, but also that no country vigorously defended or argued for autonomous systems weapons although Czech Republic and Israel each spoke on the desirability of such systems. Unlike most countries, Canada has not yet provided copies of their statements to Reaching Critical Will or to the United Nations so we have had to piece together the statements from the CCW Review and Twitter. On day 1, Canada was the only country to say that existing international humanitarian law is sufficient to regulate the use of autonomous weapons. It also said that the definition of autonomy is difficult as autonomy is subjective depending on the system. On day 2, Canada said that the moral aspects of autonomous weapons are important and must be part of discussions in CCW. It looks like Canada did not make any statements or interventions on Day 3. On day 4, Canada called for more discussion on the ethical and political issues including meaningful human control under the CCW. Canada also said humanitarian and state security concerns must be balanced in considering autonomous weapons – which is language usually heard from Russia, China and similar states. Technological Issues – key topics included definitions of autonomy and meaningful human control. Included a debate between Ron Arkin who believes that it is pre-mature to ban autonomous weapons and Noel Sharkey who does not believe that computerised weapons without a human in control can fully comply with international humanitarian law in the foreseeable future. Ethics and Sociology – key topics included if machines should make the decision to take a human life, the relevance of human judgement to international law and the need for human control. Legal Issues (International Humanitarian Law) – key topics included definitions, whether or not autonomous weapons systems are inherently illegal, morality and military effectiveness. This was an extensive debate. Legal Issues (other areas of international law) – key topics included human rights law, accountability and article 36 weapons reviews. Operational and military issues – key topics included meaningful human control, military effectiveness and the nature of warfare. The Campaign to Stop Killer Robots held side events each day to delve deeper into the issues at hand. These side events were well attended and lively discussions covered the topics at hand in greater depth. Paul Hannon was on Calgary’s News Talk 770 and News Talk 610 in St. Catherines. Erin Hunt was on Kevin Newman Live (starts 2:40 mark) and CFAX 1070 in Victoria (starts 6:07 mark). Dr. Ian Kerr was on Ontario Today – you should definitely check out the call of the day. The Globe and Mail, the Weather Network, Global News, CTV News, Ottawa Citizen and Metro also covered the issue while the Ottawa Citizen Defense Blog picked up our press release. CCW member states will reconvene in November to decide if they want to continue these talks. Until then Mines Action Canada and our colleagues in the international campaign will continue to push for a renewed and expanded mandate including continued discussions on meaningful human control over all targeting and firing decisions. Posted on May 20, 2014, in Events and tagged campaign, Geneva, international law, killer robots, Stop Killer Robots, United Nations. Bookmark the permalink. 1 Comment.